Branding is a long, hard process, but in today’s cluttered market of startups, new businesses, and entrepreneurs, it’s an important one to get right. A well-designed brand often seems effortless. Color is just a part of branding, and it’s a vital one, as it can catch and keep our attention just as well or better than a great logo or slogan. Our Color Finder service is designed to help you build a great brand—no hassle included. We know we’re preaching to the choir when we say that colors can make or break a brand. Everyone’s familiar with the old adages of color psychology and design: red makes you hungry, blues calm you down, and shades of grey are objective and rational. There’s no denying that color plays a huge role in brand perception, preference, and even purchasing decisions. Brands benefit from colors that are perceived as appropriate for the product or service being offered and memorable designs, whether or not there’s a “right” color for the industry. This opens up a world of creativity. Without being limited to a certain palette, brands are free to create an aesthetic that’s unique and fully their own. What really matters is how it’s presented. Creating a cohesive brand means incorporating your design choices into every aspect of the business—from logos to furniture. We make that part easy. 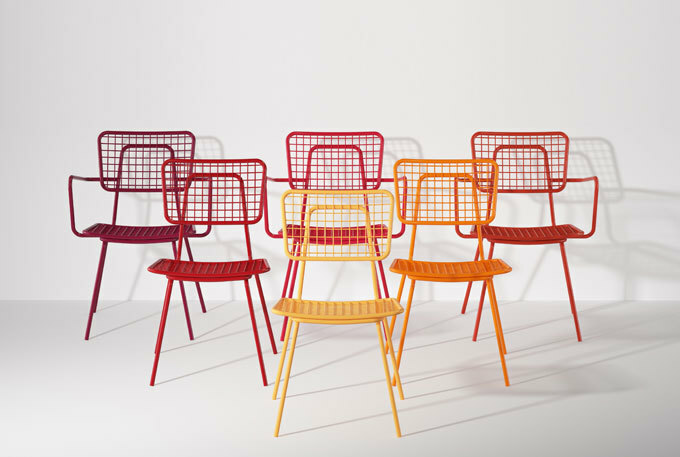 Use colored metal chairs and tables to add accents to the areas of your business that people interact with the most and create a one-of-a-kind environment. 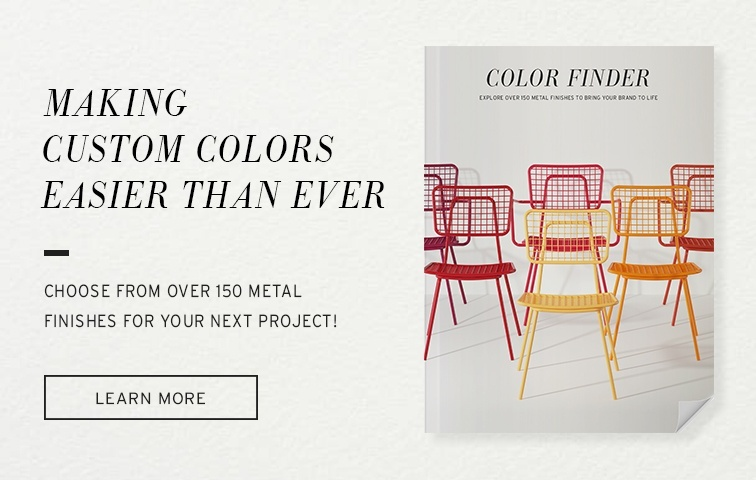 The Color Finder is a powerful tool in any designer’s arsenal: see for yourself how businesses have used colored metal furniture to bring their brands to life. This minute food stall in Atlanta shows that you don’t need a much space to make a big impact. 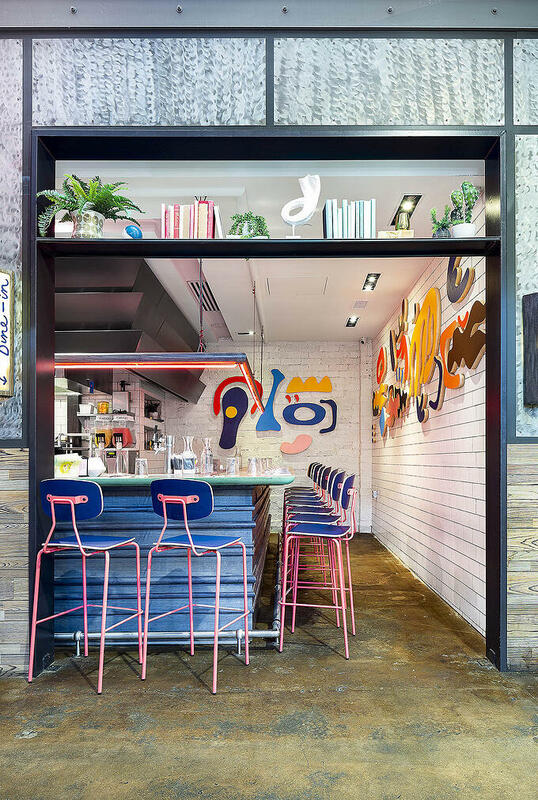 Recess uses bright, eye-catching colors and whimsical design elements to align its environment with its vibrant, exciting food offerings. Our Reece Barstool becomes something entirely new with bubblegum pink frames contrasting with the rich blue seats and backs. Altogether, it’s a restaurant that stands out with undeniable personality and pizazz. 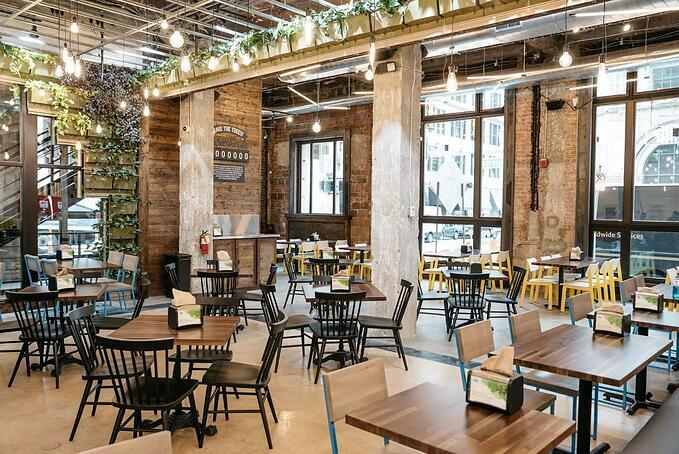 Brome Modern Eatery in Detroit marries rustic, industrial, and modern for a restaurant space that reflects the company’s mission-focused and forward-thinking business practices. The pops of color from Brady’s blue frame and Sadie II’s sunny contrast make a statement amidst woodsy browns and greens. These contemporary touches speak to Brome’s commitment to sustaining the natural environment of the Midwest, ensuring that the comforts we enjoy today will be available well into the future. The beautiful, bright design of LOVJuice is so well thought-out and executed that you’d never know the tight deadline and budget that were set for the space. The neutral whites and grays are a blank canvas for playful splashes of green on the walls, plants, and legs of our Harper Chairs and Barstools. 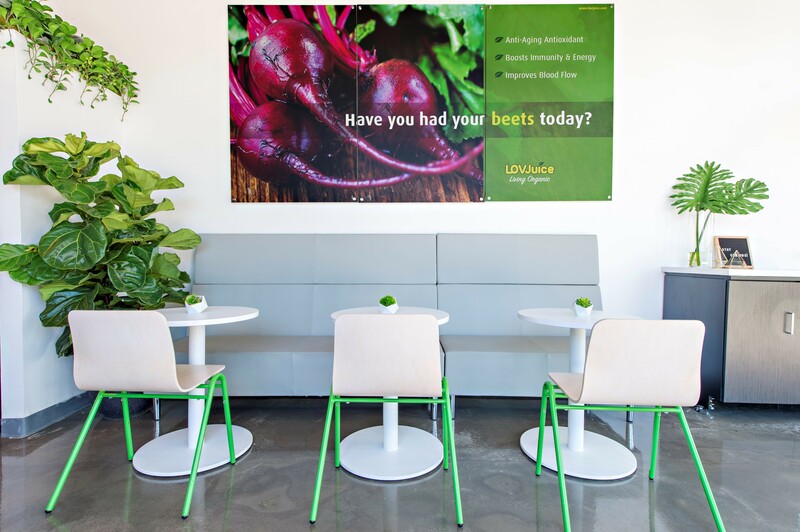 Perfectly matched to LOVJuice’s logo, the colors allow the brand to manifest into physical space, creating a consistent experience at every moment. Interested in what designs you could create with our Color Finder service? Download the brochure now to see our colors, prices, and details.